Everyone is aware of the smell of vanilla eliquid once it wafts into the air, however has anyone ever experienced a REAL vanilla taste? There are lots of variations of vanilla out there. 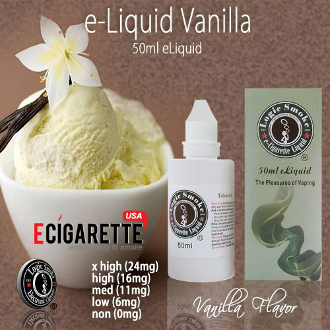 We’re not huge on having variation when there ought to be one standard that a particular flavor lives up to, that is why we've zeroed in on vanilla to make you vaping experience the sweetest and most enjoyable. By taking all of the top notch vanilla variations out there and finding the right, common balance between them, we’re setting a brand new precedent for vanilla lovers all over. With the perfect blend of an 80/20 PG/VG eliquid mix (propylene glycol and vegetable glycerin (organic, food grade preservative compounds), you'll get the best flavor concentration along with the perfect amount of vapor to satisfy your vaping needs.